India's Saurabh Chaudhary and Manu Bhaker won gold in the 10m air pistol mixed team event at the 12th Asian Airgun Championship in Taipei. Saurabh Chaudhary soaked in the pressure and had Manu Bhaker's back even when the latter seemed to fluff her concentration, to clinch a mixed team gold at the Shooting World Cup. India's Saurabh Chaudhary and Manu Bhaker won gold in the 10m air pistol mixed team event on the final day of the shooting World Cup in New Delhi on Wednesday. Bhaker, who had burst into tears after finishing fifth in the 25m pistol, did not fare much better in the 10m air pistol, scoring a total of 572, the third lowest of her international career. If you're from a country where you aren't even allowed to touch a rifle, how do you train for an event? Jonathan Selvaraj tries to find all the answers. Saurabh Chaudhary won the men's 10m air pistol gold with a world record score of 245.0 in his maiden senior World Cup, sealing a quota place for the 2020 Tokyo Olympics. Apurvi Chandela hit a world record scored of 252.9 as she blew away the competition for her first World Cup gold. With this win, Chandela becomes only the second Indian after Anjali Bhagwat to win gold in the women's 10m air rifle event at a World Cup. Jonathan Selvaraj explores how India's talented new generation of shooters are being primed to be champions by veterans of a previous. The International Olympic Committee has decided to "suspend all discussions" with India regarding hosting of global sporting events after Pakistani shooters were not issued visas for the World Cup in New Delhi. The contradictory statements coming from the ISSF and NRAI chiefs at the World Cup opening ceremony have caused more confusion among shooters competing in New Delhi. Two Pakistani shooters, who were supposed to participate in the men's 25m rapid fire pistol event, did not get Indian visa in light of the heightened tension between the two countries following last week's terrorist attack in Kashmir. 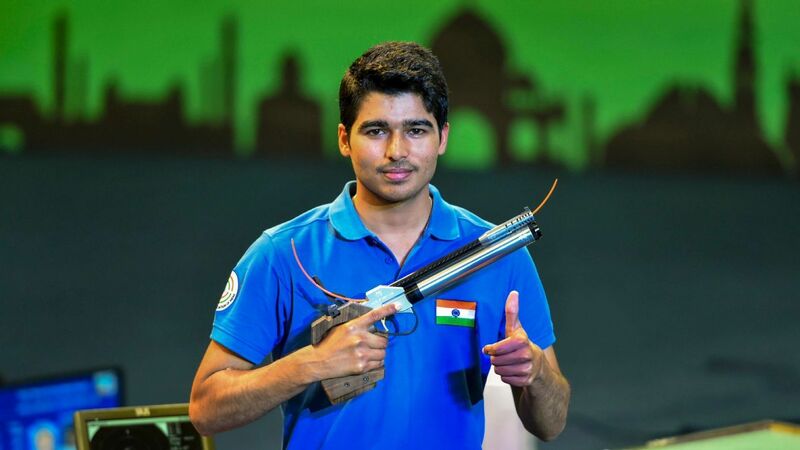 Saurabh Chaudhary claimed the gold medal in the 10m air pistol event at the Youth Olympic Games, capping off the Indian shooting team's best-ever outing in the mega event on a rousing note. Manu Bhaker produced a spectacular performance to claim India's first ever gold medal in shooting at the Youth Olympic Games. Ankur Mittal became the first Indian to win the double trap gold at the shooting World Championships after scoring 140 in Changwon, South Korea on Saturday. When Om Prakash Mitharval began competitive shooting three years ago, Jitu Rai was the reigning pistol king. Three years later, it's Jitu looking up at the podium. Om Prakash Mitharval won India's third gold at the ongoing shooting World Championships in Changwon, South Korea after shooting a score of 564 in the 50m pistol event on Tuesday. An avid painter, 24-year-old Anjum Moudgil clinched a spot in the 2020 Olympics after winning a silver medal in the 10m air rifle event at the World Championships. Anjum Moudgil and Apurvi Chandela became the first Indian shooters to win a quota for the 2020 Tokyo Olympics. Sixteen-year-old shooter Manu Bhaker tasted the first significant loss of her young career, drawing a blank in Indonesia. But there are plenty of positives to take away. Affectionately referred to by his team-mates as the baby of the group, 15-year-old Shardul Vihaan did not let his obsession for video games ruin his preparations for the men's double trap event. Four years ago, a freak accident threatened to crush Rahi Sarnobat's dreams. She fought her way through excruciating pain and a frustrating rehabilitation to make shooting history at the Asian Games.